Bonnet Cleaner Carpet & Rug Shampoo is the ideal product for bonnet cleaning systems. Cleans and rinses effectively with hot or cold water. Contains non-toxic inhibitors to prevent mildew stains and odors. No rinse needed! Gentle to skin. Bonnet Cleaner Carpet & Rug Shampoo is safe for workers and customers. Gentle on skin. 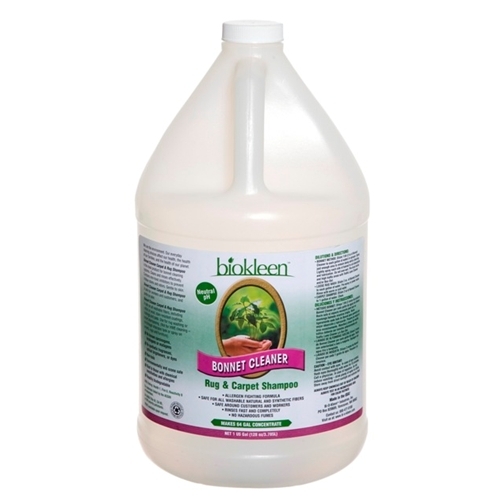 Bonnet Cleaner Carpet & Rug Shampoo is safe on all washable fibers. - Non-Toxic. - Environmentally and ozone safe. 1 Gallon of Bonnet Cleaner will make 64 Gallons of Cleaner.